Want a quick but elegant and delicious side salad? Look no farther, this spinach salad only takes minutes to prepare. 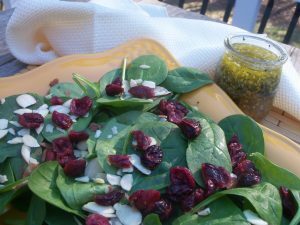 A simple bed of spinach with toasted almonds and dried cranberries tossed with an amazing dressing that completely makes this salad. This recipe is for a larger salad, but very easy only to prepare half. Enjoy! For the dressing: In a bowl or jar whisk together all ingredients until mixture is well blended. For the salad: Add spinach, almonds and cranberries to a salad bowl. Drizzle dressing over salad and toss. Serve immediately after adding dressing.